It’s official: THE MINDY PROJECT will live on. Hulu picked up the recently-cancelled Fox comedy for a 26-episode fourth season, the streaming site announced. The series joins other upcoming Hulu originals, such as the Jason Katims-produced family drama, THE WAY, and the upcoming Bad Robot adaptation of Stephen King’s 11/22/63. Super Bowl 2015 Ad: Is Mindy Kaling Invisible? Comments Off on Super Bowl 2015 Ad: Is Mindy Kaling Invisible? What would you do if you were invisible? Well, if you’re Mindy Kaling (or, at least, the Mindy in this Super Bowl ad), you’d go through a car wash, eat some food…and try to kiss a hot movie star. The season 3 cast photos for THE MINDY PROJECT are here! THE MINDY PROJECT returns Tuesday, September 16th at 9:30 PM on Fox. When THE MINDY PROJECT cast and creative team had their PaleyFest panel earlier this year, it seemed like Danny and Mindy were finally going to move forward with their relationship. And while they did take that step, the duo also quickly broke up, and it took until the comedy’s second season finale for Danny and Mindy to fully commit to being all in on their romantic relationship. But it’s never a completely easy decision to make the decision to pair up a will they/won’t they couple, a fact that THE MINDY PROJECT creator/star Mindy Kaling (Mindy) pointed out during Fox’s Girls’ Night Out panel earlier in the week. Fox hosted a Girls’ Night Out event on Monday to celebrate some of the network’s leading ladies — both onscreen and off — and Jane Lynch (GLEE), Mindy Kaling (THE MINDY PROJECT), Chelsea Peretti (BROOKLYN NINE-NINE), Yeardley Smith (THE SIMPSONS), Alex Borstein (FAMILY GUY), NEW GIRL creator Liz Meriwether, SLEEPY HOLLOW executive producer Heather Kadin were a part of a panel to talk about their respective shows and experiences. 24: LIVE ANOTHER DAY: Check Out the New Trailer and Key Art! THE MINDY PROJECT has been off the air since January, and one of the things that has kept fans buzzing in that time was Danny and Mindy’s episode-ending kiss. But while some viewers may have been waiting for that moment for much (or all) of the show’s run, the people behind the series weren’t initially sure they’d go down that road with those characters. The potential coupling of Mindy and Danny has drawn comparisons to Kaling’s former series, THE OFFICE, where co-workers/friends Jim and Pam has their own slow build to a relationship, but Kaling isn’t as sold on that analogy. 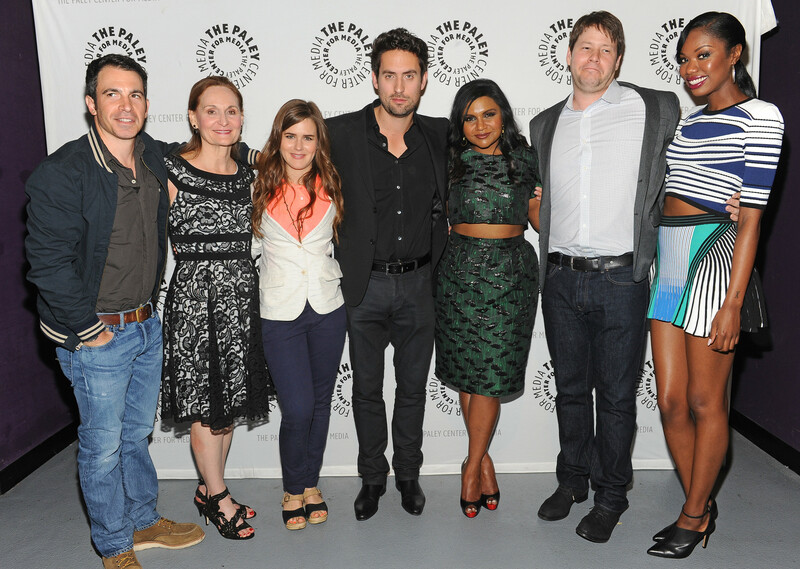 For the second year in a row, THE MINDY PROJECT was honored during PaleyFest. THE MINDY PROJECT’s Mindy is fresh off of a breakup, and that is leading her directly to rebound with…Morgan?! Yep, in this week’s episode of THE MINDY PROJECT, Mindy contemplates crossing the line with Morgan when she discovers that Morgan’s exes have a history of immediately rebounding from him with the love of their life. But it’s THE MINDY PROJECT, so things clearly won’t go as smoothly as either of them intend. James Franco has landed a two-episode guest arc on THE MINDY PROJECT, Fox announced. He’ll first appear in the second season premiere, and will also appear in the comedy’s second episode of the year. Well…Mindy is going to have a lot to say about that. Are you excited to see Franco on THE MINDY PROJECT?